If your DTL code references the properties of the aux, context, or process systems objects, enter values for these properties to see the results as if the data transformation was invoked with these objects instantiated. The table for entering values appears only if the DTL references the internal properties of aux, process, or context systems objects. For EDI messages, the window displays raw text; have some saved text files ready so that you can copy and paste text from these files into the Input Message box. 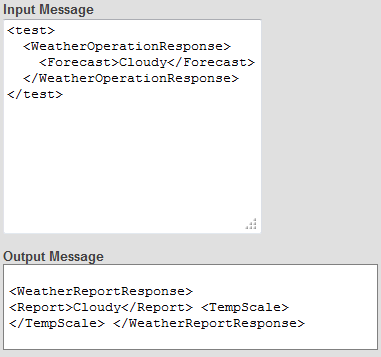 For regular production messages, the window displays an XML skeleton with an entry for each of the properties in the message object; type in a value for each property. For record maps, complex record maps, and batch record maps, you can enter raw text or XML.